The beautiful and impressive Batu Caves, near the city of Kuala Lumpur, Malaysia are a fabulous family experience as they have something for everyone. 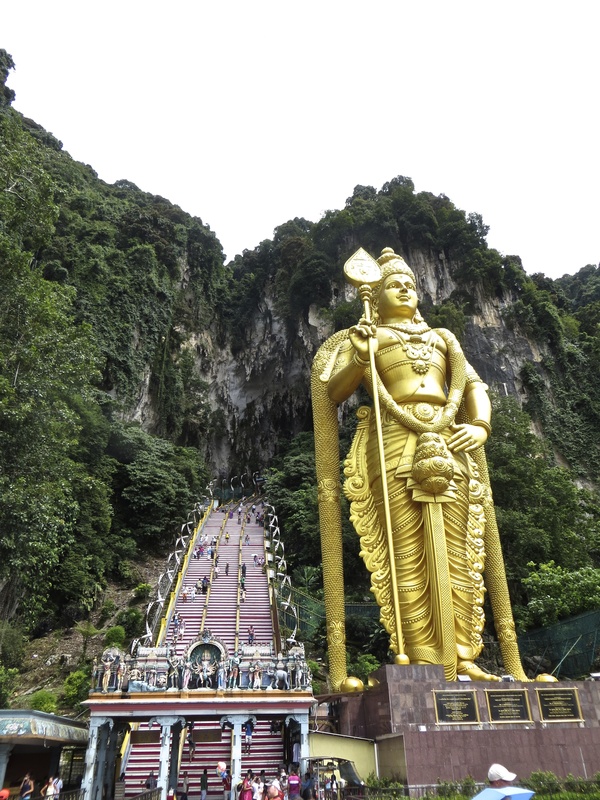 The Batu caves are first and for most a shrine and a place of religious importance. You will see Hindu families participating in many hindu rituals. Guarding the caves is a giant statue of Murugan, a Hindu deity, that stands an impressive 42 meters high. The adventure lover will enjoy the hearty climb up the 272 steps leading to the cave. It’s not an easy ascent and even more daunting for those dedicated souls who have fasted and/or participated in ThaiPuSam. For the animal lover, Macaque Monkeys line the steps and try to steal food and act silly. There are lots of photo opportunities. As a rule- never feed the monkeys! It is beautiful! I loved seeing all the children with the shaved heads. We were there right before Taipusam and saw some dedicated should making their way up the steps with various hooks and things attached to them in a weakened state. It was very impressive.